When you step into one of the children’s ministry rooms at our church you’ll see a large wall-hanging, prominent in the space. It looks like a clock but there is only one hand. In place of numbers and minute-marks are blocks of varied colors: purple, white, green and red. There are more green blocks than any other and only one red block. The purple and white blocks always adjoin each other and there is a curious sequence of white blocks that feels to me like attention-getting laughter, unstoppable and overflowing. It is definitely a clock but…what kind of clock could this be? Some people call it the “church clock” but I prefer to call it a Sabbath clock. Here’s why: it tells time by days of rest. The children are both fascinated and frustrated by this clock. Each week they get to move the hand one block, but that is all. Time on this clock does not move very quickly. In fact, it is downright slow! Some children have made their peace with that while others invariably want to move the hand 4, 5 and sometimes 12 spaces at a time. I suppose adults are that way, too. The Sabbath clock is a patient clock. Mostly, it is patient with people who are impatient. Never mind, try as we might to speed up what the clock wants to form in us, she will not be rushed. We can try to move the hand more, but that will not change what color marks the day. The Sabbath clock is always true, never too fast and never too slow. We do not control her; she is like the sun that way. 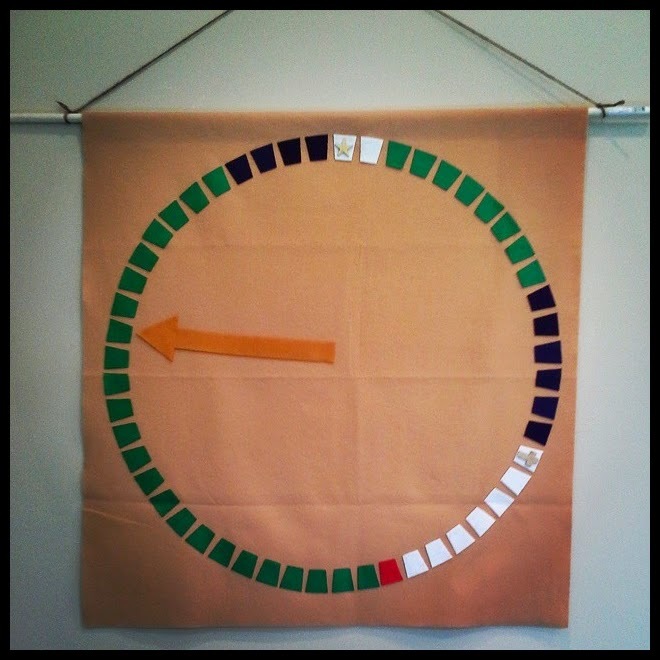 The Sabbath clock tells a story we’re in but it is not primarily our story. It is the story of God-with-us. It is the story of a surprise guest named Jesus. We waited and waited and waited for this guest until it seemed like we were waiting for Godot, the visitor that never comes. The surprise is that when God came, he came as a big God in the disguise of a little God. Jesus is the Godot that shows up at the end to make a new beginning. The story of Jesus starts small, as small as a baby—small, but new. The story of the Sabbath clock goes on to include celebration, revelation, and Pentecost—both immanence and transcendence. In a word, the story of Jesus is a Sabbath story. This clock tells a new creation story. That is why Christians changed the day of observing Sabbath from the seventh day to the first day of the week. Something new happened and happens on that first day of the week. What was dead rises. What is dead rises. What was renews to become what is and is to come. That is why the Sabbath clock marks time differently. It is a clock of past, present and future. We will never be able to tell time outside this clock. In fact, strictly speaking, it is a clock that does not even tell time—it tells eternity, which is beyond time. Yet somehow we meet this eternity in our time and place, like Christmas. We meet Sabbath in the here and now but, properly speaking, Sabbath is more a place in time than a time in place. I like this Sabbath clock because it reminds me that God is God and I am not. It reminds me of things that are beyond my control. It reminds me of a story in which I’m swept up, in which we’re all gathered like children in a full-circle hug. I like this clock because it reminds me to slow down. I do not need to be in a hurry, because…God is not limited by what I can accomplish in a work-week. God’s work is restful. God’s work is Rest. I wonder if you’d like a clock like this in your home? I wonder if you know…it’s already there, whether you realize it or not. Look for it. The Sabbath clock might be hiding in a closet somewhere, silently smiling, full-faced, waiting to be found. PlayFull is dedicated to helping people play from the inside-out. We invite you to like us on Facebook or follow us on Twitter. Thank you for reading!